“A location for the statue is currently being found within the Park, and the woodsman will remain in storage until then. I am all for putting the clock back on display (where it can be properly seen from all four sides!). I am also for ensuring that hundreds of thousands of people get the opportunity to enjoy the unique and other-worldly charm of “The Woodsman”. However, in an act tantamount to municipal vandalism, Conservative councillors intend to remove the sculpture from the urban space for which it was created and place it in a country park – changing its context, function and form entirely. There is no explanation as to why it is to be moved. We are left to speculate why Cllr Horgan advises that Wat Tyler Country Park will be “more suitable and appropriate”. 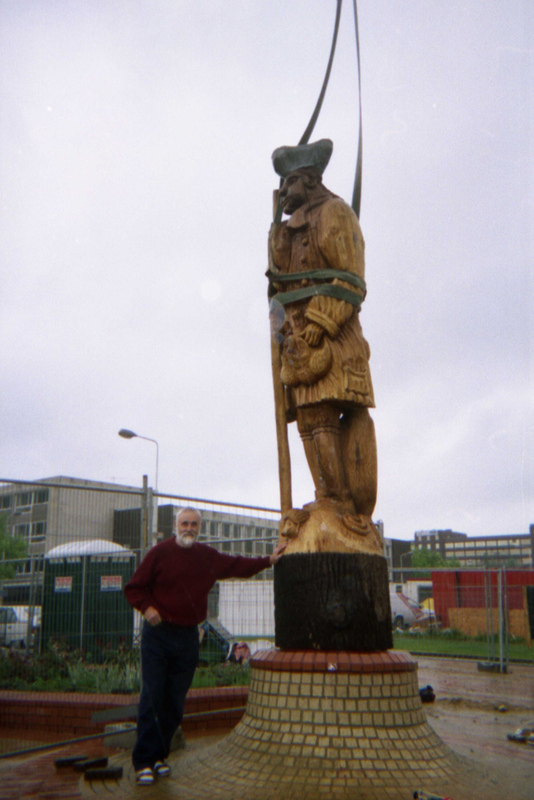 Perhaps reinstating it so close to the Council’s offices would be a potent reminder of how successive administrations – including the current Conservative administration – have failed to take care of this significant contribution to Basildon’s artistic heritage? For me, “The Woodsman” isn’t just a quirky carving. Wood is a unique medium to work with. 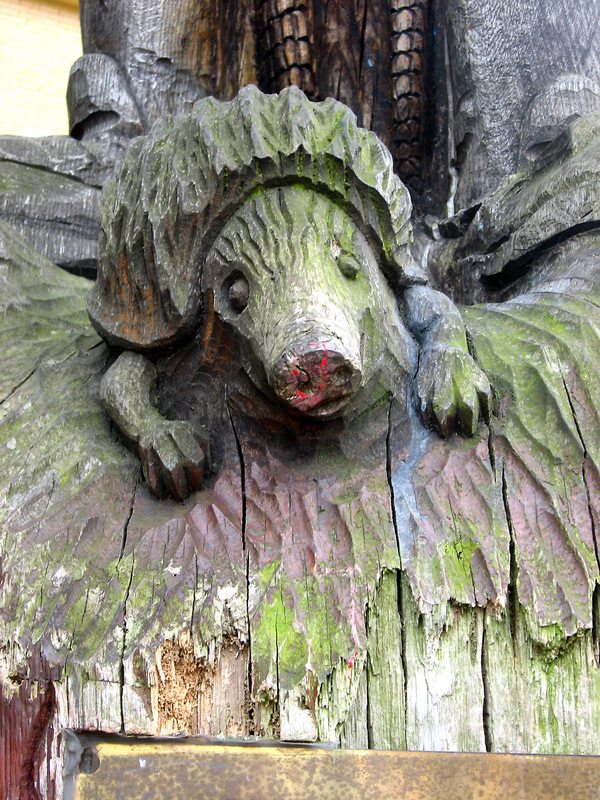 Unlike sculpting in bronze, from a cast, every single wooden carving, even if it appears the same, is very different. Each piece of wood has a different grain. Each piece of wood will have different knots to tax the skills of the carver. 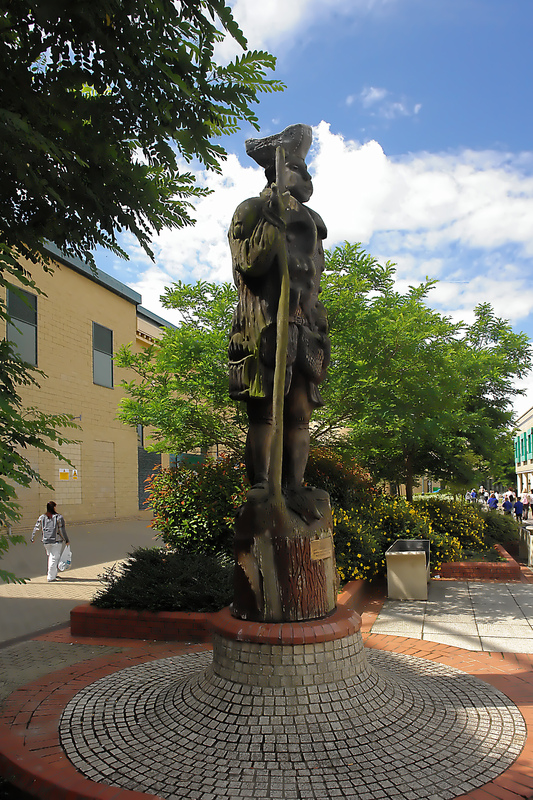 Hewn from local timber, from a tree felled in the Great Storm of 1987, “The Woodsman” is a unique piece of art designed to provoke thought and comment in the centre of a busy urban environment. In its original position, it broke up the concrete lines of the town and prompted a pause for thought, even if only a few seconds, to reflect on something that somehow managed to be both incongruous and perfectly situated at the same time. “The Woodsman” provided a connection to our history and that natural environment right in the middle of our town, where it could be enjoyed by those shopping, working, visiting the Council or passing through. We didn’t have to make a special trip to see it. Finally, it also stood as a testament to the talents of Dave Chapple, who passed away on Friday 6th November 2009. Dave had even proposed a sculpture for the Millennium Dome when the Government was seeking ideas for what to put inside. To my mind it was a stunning challenge to the material assumptions that have overtaken us, putting Christ at the centre of the building commissioned to mark the new millennium. 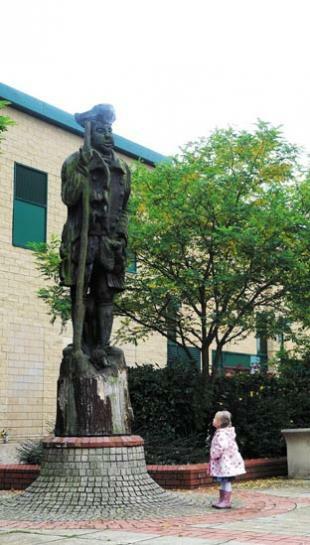 To my mind, we have lost something as a community when politicians are prepared to spend £38 million on a sporting complex, but those same politicians are not prepared to find the money, time or motivation to ensure that “The Woodsman” – created in Basildon, for Basildon – can be enjoyed by thousands in the space it was created for. “The Woodsman” is a thing of beauty that tells a story far greater than many imagine. The Town needs to remember its roots – and the people of the town want to know its history and be reminded how beautiful parts of our district truly are. And The Politicians need to remember who they represent. They also need to remember the heritage – cultural and natural – that is entrusted to them. If you are interested in seeing some of Dave Chapple’s other work, please see this online gallery. I couldn’t have put it better myself – it is absolutely heartbreaking. How can we possibly trust people like this to look after anything that matters to Basildon from our public art to our education, from our elderly to our children. The treatment of The Woodsman is emblematic of everything that is wrong with those who presume to govern us. I couldn’t believe it when I walked past on Monday. The shorn off base was a very sad sight to me. I phoned Liz straight away, had to speak to someone. I was and still am so angry about what they have done. I agree with everything said by Ben above, but I also think this..
We do have lots of nice stuff around the town (as featured in the brilliant centre page spread in last Fridays Echo), always we could do with more.. of course. However, I’m not completely sure but I think most of the existing works were gifts to the town’s people or outside commissions. The thing about this piece is that it is by a local man. Born and raised in Vange if I’m not mistaken. I know we have paintings scattered around town by local artists, which is great too. But nothing else like this. I have to say I agree, but could add more. I think the way that these people are constantly allowed to ride roughshod over this town is an utter disgrace. Something else I think is disgraceful is the way that the people responsible for this went round to Mrs Chapple house and confronted her with their ‘master plan’, while she is still obviously so vulnerable and not particularly well from what I can gather. Cowards! Disgraceful, slimy, rotten cowards! The stuff that our little group and myself have been putting out has never really been all that political and we honestly had no real plans to take it that way. But I will say this.. Because of this recent episode and for all the other stuff we’ve had small grievances about in the past year or so with Mr Blake and his gang (and lets not forget Horgan and many others in the current regime too) we will now be using our platform to try and communicate how we feel about this mob. If we can persuade anybody to give them the big swerve in future, we’ll be happy. Because if we don’t let them in, in the first place and if we can demonstrate to the next lot what lessons they should learn, then surely Basildon will be a much better place. If this doesn’t now show everybody that we really must organise some sort of forum for local Arts and Culture, then I just don’t know what it will take. Oh yes and also interesting (well.. to me anyway) Am I mistaken or has it suddenly changed to ‘Leisure and Arts’ now? Suddenly I keep seeing it written as ‘Leisure and Arts’ and not the other way round. Was this one of those crappy PR things? Kind of trying to change the emphasis?